Glee's Melissa Benoist and Blake Jenner Are Married! Melissa Benoist and Blake Jenner are married, E! News confirms. A source adds that the two tied the knot this spring. Over the weekend, E! News caught up with the 26-year-old actress at Comic-Con International in San Diego, where she was promoting her CBS show Supergirl and was seen sporting a tiny silver band in her ring finger. She's also been wearing the telling jewelry piece in a few of her recent Instagram pics. The blond stunner and her 22-year-old man have made no secret of their relationship on Instagram. In fact, Benoist regularly posts PDA and flaunts her love for her hubby on the photo-sharing site. MORE: Check out Melissa Benoist in her Supergirl costume! "...and nose smooshing @blakedaflake," she captioned a recent shot. The lovebirds reportedly got engaged in July 2013, and five months later, the actors opened up about their nuptials in an interview with E! News. "We're just excited that it's happening," the couple said when asked if they had started planning their big day. "We're just focusing on work right now so whenever that happens…"
"Supergirl" Costume Makes Stars Flip! 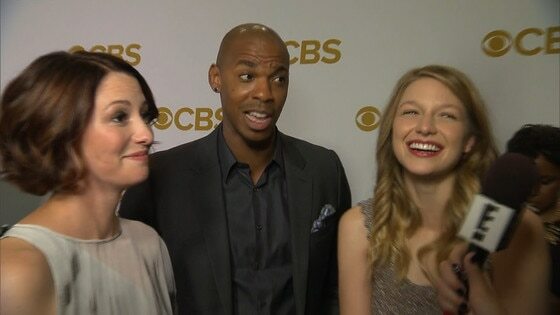 Benoist added that their wedding will be "small and intimate and nice." The newlyweds first met on the set of the hit Fox series Glee, with both signing on to the show in 2012. Jenner played Ryder Lynn while Benoist starred as Marley Rose.